There is something about a trade union that the business press just doesn’t get. Take Crain’s. Crain Communications owns thirty business publications, among them the health industry heavy-hitter Modern Healthcare and New York Business. Their audience, they say, is made up of “affluent educated, powerful executives.” So it’s no surprise that for their Labor Day edition the editors published a less-than-glowing profile of one of New York’s most innovative labor leaders. What was surprising, for a twenty-first-century newspaper, was the way that in her article on Jill Furillo, executive director of the New York State Nurses Association, Crain’s reporter Barbara Benson worked the word “Communist” into the third paragraph. Quoting a 1975 article written by Furillo when she was 24 years old, writer Benson attributes the reinvigoration of New York’s largest nurses union to Furillo’s history of “fiery activism.” “Her earlier belief that capitalism leads to social and economic inequality influences her values today,” wrote Benson on August 31. Furillo doesn’t deny it. She’s in excellent company. Critiques of capitalism are pretty popular. They “poll as well as the GOP,” says media watcher Jim Naureckas of FAIR. But that is hardly the point. Benson’s story came just as NYSNA had settled a good contract for 8,000 nurses at New York’s public hospitals; as the union enters negotiations for 18,000 RNs at seventeen private facilities (including the big ones like New York Presbyterian and Montefiore), and just days after the group filed for a union election at St. Mary’s Amsterdam, in the Albany area. Reformers have been gaining power within NYSNA for twenty years. In 2011 they won a majority of seats, and a year later, at a special convention 2,400 members pledged to take a more aggressive stand against staffing cuts, closures and managerial influence in their union. “Benson covered our convention at the Jacob Javits Center—I wish she’d looked at her notes,” says Kane. Kane and her fellow reformers ran on a platform: Staffing, Security and Strength. “Jill didn’t bring the agenda to us, we hired her to carry it out,” says Kane. Furillo didn’t come on as ED until months after the event. Might NYSNA do what the Chicago Teachers Union has done, and transform itself from a go-along professional association into a respected fighting force? While hardly hidden, NYSNA’s agenda certainly extends well beyond the bedside. It was the first labor group to endorse the People’s Climate March (something chemical magnate David Koch, who sits on the board of NY Presbyterian, is sure not to like), and the group has been a leader in the community-labor coalition that has kept the doors open at two New York area hospitals. 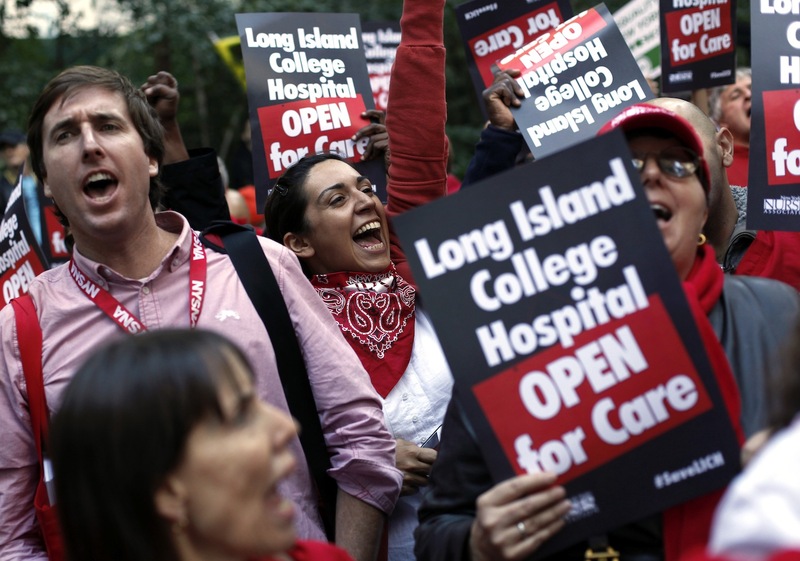 Cutting close to Crain’s heart, the group lobbied hard against the Cuomo administration’s plan to let private businesses own or operate hospitals for profit. Just months after the legislature failed to act on the topic, Crain’s dedicated one of its high-priced conferences to the question, “Is private equity investment in healthcare really so scary?” The keynote speaker was a speculator who told the crowd he’d made “four times his money” on a hospital investment. Ironically, the article Crain’s quotes, written by Furillo in 1975, was a critique of the media and monopoly capital’s “hideous use of the press.” Her 24-year-old self wasn’t wrong. Crusty old Crain’s just made her point.